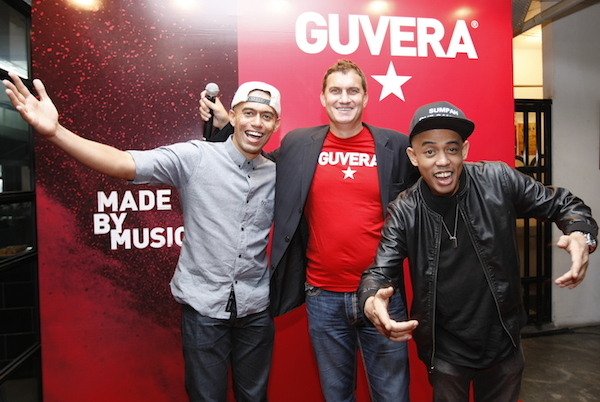 Altimet, Michael Wallis-Brown, CCO Guvera Global, President and Managing Director, Guvera Asia, and Joe Flizzow. Guvera, the unlimited music streaming service is now available in Malaysia. Programmed globally but tuned locally, millions of songs from top international and local artists are just a click away. Search, discover, create, play, share and manage the music you love with Guvera. Developed in response to the mass consumption of illegal music online, Guvera provides users with a legal way to access music online that awards royalties to the artists and record labels responsible for producing it. One of Guvera’s key features is that it provides and supports local content, curating specialised playlists that feature local Malaysian artists such as Joe Flizzow, SonaOne, Faizal Tahir to name a few. With a service that is programmed globally but tuned locally, Guvera plans to reach out to the local music community to continually support the growth of the local music catalogue. Another unique feature of the service provides users with the ability to tailor a music experience based on their current mood, activity or preferences by searching for music using hashtags. Rewarding listeners is the other area where Guvera sets itself apart from other services. For its top listeners, Guvera rewards them with special offers as well as opportunities to win “money-cannot-buy experiences” from Guvera’s music partners. To celebrate its entry into Malaysia, Guvera is staging a concert at an exclusive venue in Kuala Lumpur this Friday. The event will be headlined by international hip hop star and actor Mos Def, now known as Yasiin Bey, and also showcases local acts Joe Flizzow and SonaOne among others. Michael Wallis-Brown, CCO Guvera Global, President and Managing Director, Guvera Asia and Foo Mun Yee, Country Sales Manager, Smartphone Division, Lenovo Malaysia. Guvera also recently signed an agreement to become the World Wide Music partner for Lenovo. In collaboration with Guvera, Lenovo’s mobile devices, including tablets and smartphones, will be pre-installed with Guvera’s music streaming service application, making Guvera a truly global player in the digital music streaming industry together with Lenovo. This partnership will see Guvera significantly expanding its footprint not only in Malaysia but globally as well. Guvera has international music licensing agreements with Sony, Universal Music, One Stop Music as well as Kartel Records, a local record label that houses a number of major local artists. Guvera Play is a free, ad-supported service that offers users the best expert-curated access to music with no subscription fees on all devices, including tablets and smartphones. Users also have the option to subscribe to Guvera’s Premium, on-demand service called Guvera Platinum, which starts from as low as MYR14.99 per month with unlimited access for online and offline listening. You can enjoy Guvera’s award winning application on iOS and Android devices, as well as on the web at www.guvera.com.